A homeowner called us to see if we could help him. He had installed a “do it yourself” epoxy garage floor coating a year or so prior to calling us and the coating had begun to fail (SEE PHOTO TO RIGHT). To make matters even worse, the slab in his 2 car garage (which was nearly 30 years old) had nearly 100 linear feet of cracks in it. He was in the process of remodeling his home and putting new cabinets in his garage and wanted his garage to have a “finished” look to it. 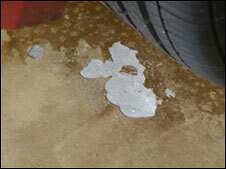 We were able to remove his old, “do it yourself” epoxy floor (for no additional charge). 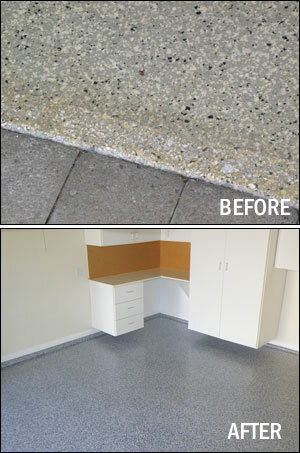 We then repaired his concrete slab cracks using our proprietary fast curing and extremely tough crack filler. Despite the fact that some of his cracks were nearly ½” wide, we were able to repair all of the cracks which gave us a smooth and homogenous surface on which to install the SpartaFlex coating. We completed the job in just 1 1/2 days (we needed a little extra time for the removal of the old coating and crack repair). Our ability to meet his schedule was important to him because he had a family gathering upcoming and some of the other subcontractors working on the job had tight schedules that were not flexible. We basically had 2 days to remove the old floor, fix his cracks and install the new floor. We met his schedule, got the work done on time with time to spare. His other subcontractors were working in the garage the same day we finished and he was able to complete his entire remodel project in time for the party! 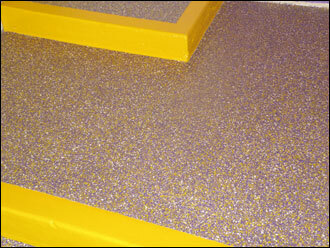 He selected a special order chip blend for his new garage floor that matched the team colors for the Los Angeles Lakers which was the hit of the party. 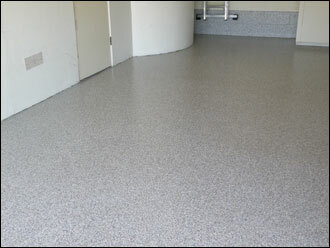 We received a call from a homeowner who had a custom epoxy floor installed in her home about a year and a half earlier. 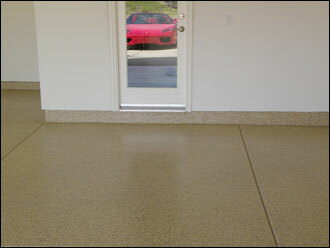 One day she returned home to find that her car tires had pulled her epoxy floor off the garage slab (SEE PHOTO TO LEFT). She called the company that had originally installed the floor only to find that they were no longer in business. She called us and asked if we were able to help her. During our visit, we determined that her slab had a extremely severe moisture problem evidenced by efflorescence (white mineral deposits) pushing up through the concrete slab floor. That moisture had caused the old floor to fail. We removed the old floor and before we installed a new SpartaFlex garage floor, we put down a prime coat of AquaLok to seal and harden the slab thereby reducing the likelihood that moisture will damage a new floor coating. The entire project including removal of the old floor and installation of the new floor over the AquaLok primer took 1 1/2 days. We received a call from a homeowner who worked for a large home building company. 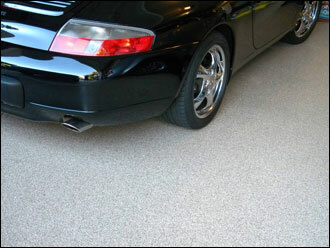 He had just purchased a new home with a very large garage (over 1,000 sqft) in one of his developments and he decided he wanted a new garage floor coating installed in his new home before the movers arrived with his belongings in 2 short days. 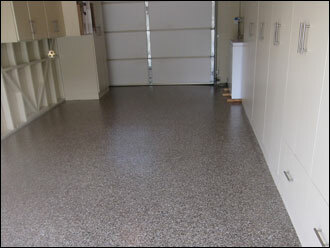 His home building company did not offer garage floor coatings as an option because they did not like the long curing times associated with epoxy and urethanes so he turned to us for a solution that would meet his tight schedule. 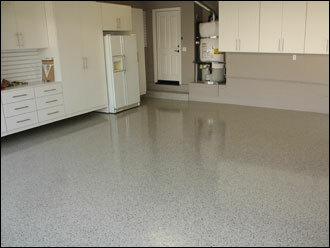 Thanks to the fast curing properties of SpartaFlex, we were able to install his garage floor in just 1 1/2 days. His movers arrived on schedule and their loaded dollies never left a scratch on his new floor. An architect/designer husband and wife were remodeling their beautiful beachside home. 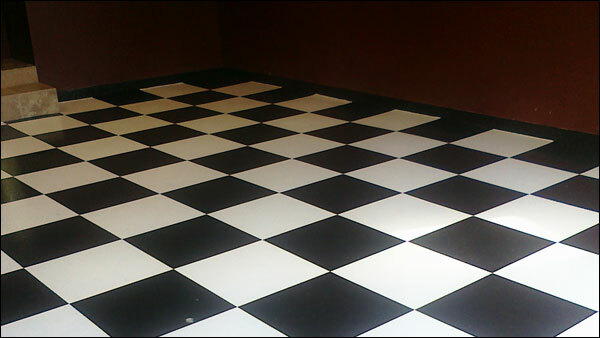 They didn’t want the typical “flake” garage floor and instead had us install a “checkerboard” black and white pattern on their floor with a non-slip surface. 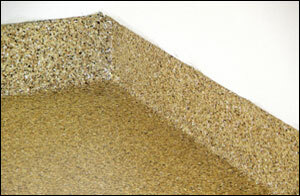 The work was completed in 2 days and cost far less than they expected.